So, I've made a point of ignoring the current presidential race here in my blog not only because of the lying, dishonesty, and ridiculous rhetoric but because I cringe every time I hear someone try to justify such dishonorable behavior. The candidates do enough fake apologizing and excuse making; I truly don't need to hear that someone not only believes it but also spouts it back. 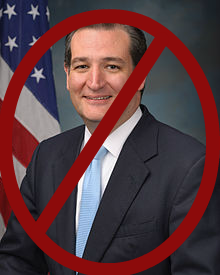 However, yesterday Ted Cruz did something that needs a statement. Cruz and his campaign have presented the field with a myriad of underhanded tricks, acting surprised when people complain. Or as Cruz said, "When you win campaigns, the people that lose tend to be unhappy about it." I've heard people try to justify the actions, claiming that Cruz didn't personally approve of the behavior and really, we can't expect him to know everything about his campaign, right? Wrong. Dead wrong. Cruz is trying to become the President of the United States. If he can't keep track of what his campaign is doing, how is he supposed to run our entire country??? And Cruz knows exactly what's going on, because he hired a man known for dirty tricks, "stretching" the truth (as if it's rubber), and scorched earth - Jeff Roe. You can read all about it in this New York Times article, but I'll sum it up for you. Cruz hired someone who he knew uses underhanded tactics because winning for him is more important than how he wins. What needs the statement, though, is Cruz is sacrificing one of his people to attempt to distance himself from the fallout of his own campaign's actions. By firing one of his senior communications managers, Cruz can say that he's taking control of the situation, even though he knew what was happening. Just when I thought the man couldn't sink lower in my opinion, he proves me wrong.